Workout 2 is a gymnastics-chipper with 12‘ timecap. If you finish the first part of the WOD within 4 minutes, the timecap extends to 8 minutes. Finishing the first two parts within 8‘, the timecap extends to 12 minutes. 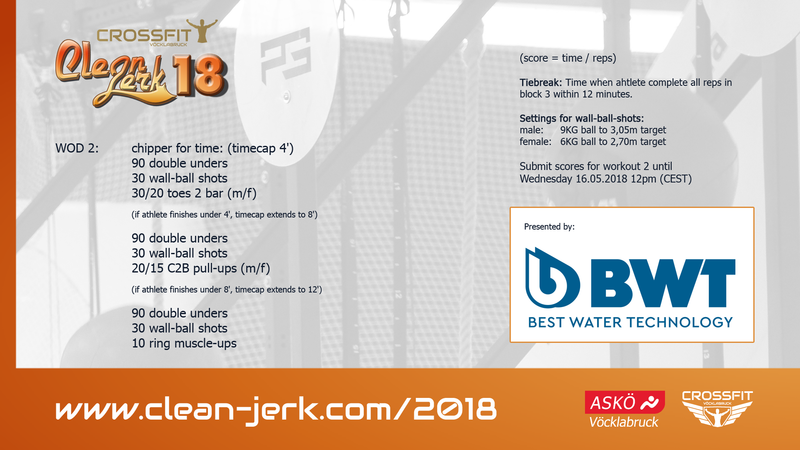 Your score will be the total number of reps that you have completed within 4, 8 or 12 minutes, and the tiebreaker is your time, when you finished your last rep.
double-unders: the rope must pass completely twice under the feet to count as a rep.
wall-ball shots: your hips below the knees in the starting position of each rep and the ball hitting at or above the target (male 3,05m | female 2,70m). toes to bar: going from a full hang to having the toes touch the pull-up bar with both feet at the same time. Each rep starts wtih the arms fully extended and the feet must be brought back behind the bar. An overhand, underhand or split-grip are all permitted. c2b pull-ups: arms fully extended at the bottom. The chest must clearly come into contact with the bar below the collarbone. ring muscle-ups: Elbows must be fully locked out while in the support position above the rings. The heels may not rise above the height of the rings during the kip. • Athlete must show video, when asked and provide within 48 hours. • The athlete must be on screen for the whole video and timer must be seen. • Before starting the workout, the athlete has to give notice about the workout, the used equipment and the athletes name.